Saudi crown prince Mohammed bin Salman may have been involved in a plot to lure journalist and prominent Saudi critic Jamal Khashoggi from his home in Virginia to Saudi Arabia, The Washington Post reported on Tuesday night, citing US intelligence intercepts. Additionally, the intercepted intelligence raises questions about whether the Trump administration was obligated to warn Khashoggi that he may have been in danger. Khashoggi, a former adviser to senior officials in the Saudi government who had been living in the US, entered the Saudi Consulate in Istanbul on October 2 to secure official documents. He has not been seen since, leading to speculation he could have been kidnapped or killed inside the consulate. The crown prince last Wednesday told Bloomberg News that Turkish authorities were welcome to search the consulate. “We have nothing to hide,” he said. New reports published on Wednesday indicate that the Saudi crown prince Mohammed bin Salman may have been involved in a plot to lure journalist and prominent Saudi critic Jamal Khashoggi from Virginia back to Saudi Arabia. Khashoggi, a former adviser to senior officials in the Saudi government who had been living in the US, entered the Saudi Consulate in Istanbul on October 2 to secure official documents. The 59-year-old has not been seen since, leading to speculation that he could have been kidnapped or killed inside the consulate. Turkish officials have accused the Saudis of killing Khashoggi and withholding evidence that could provide clues about his disappearance. Surveillance footage recorded on October 2 outside the consulate in Istanbul appears to show Khashoggi walking into the building. There is no known footage of him leaving the consulate. The crown prince last Wednesday told Bloomberg that Turkish authorities were welcome to search the consulate. “We have nothing to hide,” he reportedly said. The New York Times cited an unnamed senior official who said Turkish authorities believe Khashoggi was killed on orders from the “highest levels” of the royal court. A former US official told The Washington Post that the operation may have involved sending a 15-person squad on two private aircrafts that entered and departed from Turkey at different times. The alleged operation resembled a “rendition,” typically used to remove someone from one country and bring them to another for interrogation. Months earlier, Khashoggi had received numerous phone calls from senior Saudi officials close to Prince Mohammed who offered him protection and other benefits if he returned to Saudi Arabia. Khashoggi told friends that he was wary of the offers, and believed the Saudi government could not be trusted to keep him safe, The Post reported. Should the Trump administration have warned Khashoggi if he was in danger? 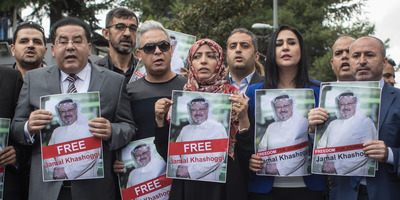 Chris McGrath/Getty ImagesProtestors demand answers on Khashoggi’s disappearance. Khashoggi was a US resident, adding to speculation that the US may have failed to adequately respond to potential threats against Khashoggi. That question gained additional significance in light of the close relationship between White House adviser Jared Kushner, who is President Donald Trump’s son-in-law, and Mohammed bin Salman. According to The Post, it was unclear to officials with knowledge of the intel if Saudi agents had discussed harming Khashoggi as part of efforts to lure him back to Saudi Arabia.